We live in a world where equities are unloved. We live in a world that really does not love equities. And who can blame the investor faced with slowing growth and a global debt mountain that is only being reduced by the teaspoon load. No big surprise that the relative certainty of triple-A fixed income is what is loved best. But when fixed income isn’t actually producing any real income at all, then positioning is extreme. It would not have to unwind much for equity markets – especially Europe’s cheap ones – to see a sharp uptick. Time to re-position for a surge? 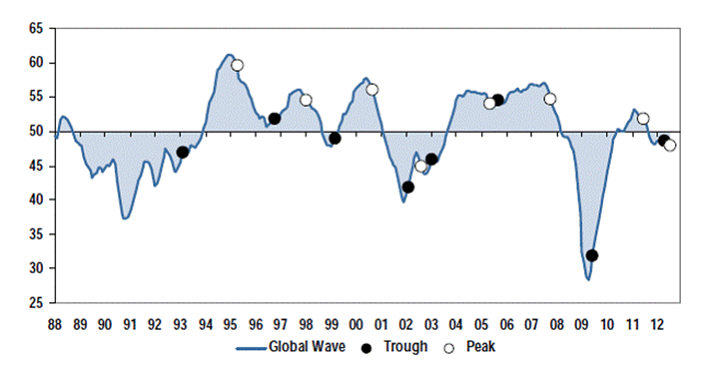 Let’s look at the fear factors in equity markets, and consider the upside. Fear: the eurozone will collapse. This would be a bad thing. Especially for the European banking system, and for the whole global financial system, which could end up experiencing another Lehman moment times ten. The eurozone’s approach to what is a fundamental existential crisis is to do nothing until almost too late, then fix a little, then undermine the fix. That’s not crazy: the German strategy is to preserve the full eurozone, but only on the basis that the rest of the zone chooses austerity and proves it can live with it. But it’s a game that has only two possible outcomes, the dismal one, and the disaster. Fear: the US falls off the fiscal cliff, and into recession. In the absence of new legislation the US is due to take around $600 billion out of personal and corporate income in 2013 alone (that’s around $450 billion in personal tax cut expiry, plus the end of the payroll tax cut, and the beginning of the planned ten-year defence budget cut). That adds up to around 4% of GDP, which adds up to recession. Fear: the BRICs crash and burn. The China hard landing has been promised so many times that you would be forgiven for yawning. Maybe that should be a red light: remember, the Chinese plan was to restructure the economy into a consumer-led one, to take the place of today’s faltering investment-led export economy. But that is the work of a generation, not a season – the latest data show that exports are still driving the economy. With commodity-reliant Brazil set to slow further, and India increasingly strangled by its own policymakers, China’s return to the invest-to-death model is not good news. Against that background, several of our market indicators are signalling the possibility of an upside gain. 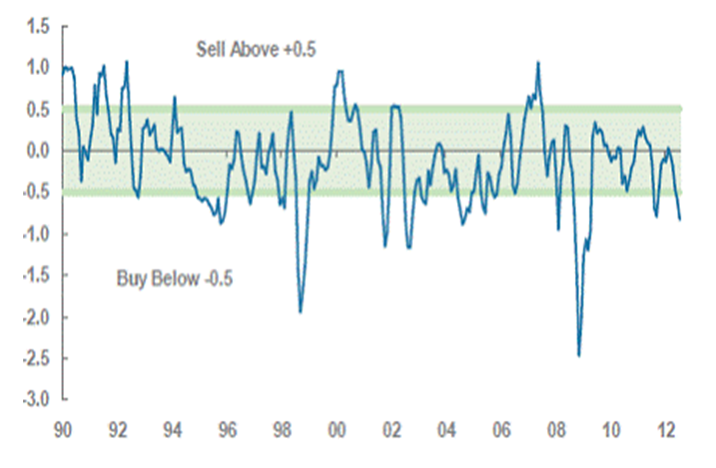 Market timing, positioning, hedge fund exposure and the earnings growth leading indicator are all consistent with the possibility of equity upside, although no indicator demands it. So, upside does need a strong catalyst. What are the best hopes of that? Best hope: the eurozone will stumble on, intact. The eurozone faces a painful choice. What is the pain of keeping the zone alive, compared to the pain of letting it fail? The pain of keeping it alive is as much political as financial – acceptance of the need for structural reform and loss of sovereignty in the south, acceptance in the north that the profligate south will need more help. Yet everyone also knows that the pain of a break-up (including a financial collapse in France) would be too much even for Germany. The risk is that break-up acquires unstoppable momentum, and the pain comes anyway. The likelihood is that muddling through stops that happening – just. Best hope: fiscal cliff no, gentle slope yes. The good news is that both Democrats and Republicans know the US economy cannot withstand scheduled tax rises and budget cuts. The bad news is that election timing and budget timing means that a compromise cannot emerge until early next year. The fact is there has to be a compromise, perhaps leaving the Bush tax cuts more or less in place until there is more growth momentum: the ghastly memory of last year’s near-default makes a timely compromise a little more likely. But still not before 2013. Best hope: China’s ‘moment of truth’ postponed, for now. Chinese data are never wholly credible, but still the data are consistent with a stabilisation at lower rates of growth. The Chinese authorities are not going to sanction the sort of investment surge that was seen in 2009, when the lending taps were turned on full blast. But nor will they allow quarterly GDP growth to fall below 7%. Restarting the investment economy may not be according to plan, but China looks unlikely to crash in the short to medium term. China’s issues are real, but too long term to worry about now. The sum total? Plenty of negatives in the picture, but they all could be a lot worse. A new bull market may not be credible, but equities are unloved and undervalued. So, curb those upside expectations a little, and you may well be pleasantly surprised.